This was supposed to be mussels but when we came to clean said mussels, most of them were open. It was 7pm by this point so we quickly returned the mussels and exchanged them for some prawns. One of the major benefits of stir-frying is the speed at which the meal comes together so the fact that it was getting late wasn’t too much of a problem. Our recent stir-fries have been a bit haphazard, basically throwing a bunch of ingredients into a pan and hoping for the best. They turn out fine, good even, but there’s nothing authentic about them so this time we tried to stick to a more Thai-style dish. This was also good and probably no better than our throw-it-all-in-and-hope-for-the-best efforts but at least we felt a little more authentic. Heat the oil in a wok over high heat. Add the spring onion, garlic, chilli and lemongrass. Stir fry for 1 minute. Add the prawns. Stir fry for 2 minutes. Add some soy sauce and fish sauce. Add the baby corn. Stir fry for 2 minutes. Add the pak choi. Stir fry for 1 minute. Add a dash of water and white wine and a little more soy sauce and fish sauce. Turn down the heat and cover, cooking for another 2 to 3 minutes. 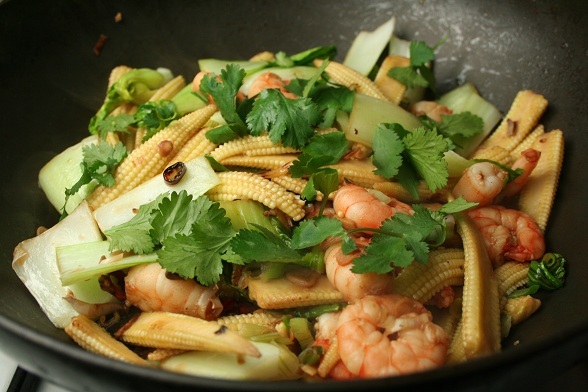 Stir in chopped coriander leaf and serve with rice or noodles.